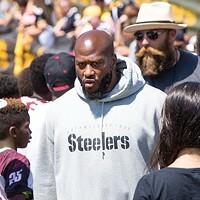 A crowd of reporters and photographers gathered on the sidelines of Chuck Noll Field on Aug. 16 as the Pittsburgh Steelers’ offense and defense squared off for 11-on-11 training-camp drills. Head coach Mike Tomlin shouted instructions. Only it wasn’t to the players, as it had been all afternoon; this time, it was to the two dozen media members at the 50-yard line. “Hey, James Conner is about to carry the ball; get your cameras ready,” said the man starting his 10th season as Steelers head coach. It was Conner’s first action in pads since the first day of camp, when he sustained a relatively minor shoulder injury. Lenses pivoted right as quarterback Ben Roethlisberger led the team to the line of scrimmage. He took the snap and Conner, the rookie running back just nine months removed from the University of Pittsburgh’s backfield, charged the line and hit the hole upright. But Conner didn’t have the ball: It was a fake, and by the time reporters and defenders noticed, Roethlisberger had already rolled out to the right and thrown the ball 20 yards downfield to a receiver. Fans and reporters would have to wait until the next play to see Conner carry the ball; when he did, the crowd cheered his two- or three-yard gain. They’d get a closer look on the following Sunday: In a preseason game against Atlanta, at Heinz Field, Conner made his NFL in-game debut, carrying 20 times for 98 yards. A pretty good first effort for a third-round draft pick. 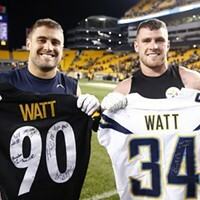 And it wasn’t just a special moment for Conner; it was a special moment for Steelers fans and Conner fans everywhere. Conner’s not your run-of-the-mill Steelers rookie. He’s a Western PA kid, a star out of the University of Pittsburgh, and a survivor with a story that captivated not just local football fans, but people from all walks of life across the country. 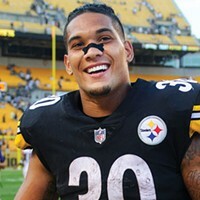 Before he ever touched a football while wearing a Steelers jersey, James Conner was already a superstar. He grew up in Erie, and was widely known, and recruited, as a defensive back. But his senior year in high school, Conner rushed for more than 1,680 yards and 26 touchdowns. When it came time to choose a college, Conner — according to a 2015 Pittsburgh Post-Gazette story — was recruited by only three schools. And only the Pitt Panthers wanted to put him in an offensive backfield. As a true freshman in 2013, Conner rushed for more than 750 yards and eight touchdowns, coming on late in the season. His most memorable game that year was a 229-yard, one-touchdown effort in the horribly named Little Caesar’s Bowl, in Detroit. Conner was named the game’s MVP, and his performance set a record for the most rushing yards in a bowl game by a Pitt player — breaking a mark established in 1976, when Tony Dorsett rushed for 202 yards en route to Pitt’s national-championship victory in the Sugar Bowl. Conner truly broke out in his sophomore year. He ran for more than 1,700 yards in 2014, and scored a conference-best 26 touchdowns. He was named the ACC’s player of the year and earned status as an All-American. Things were bright for him until his junior year, when he tore a ligament in his knee. That injury, however, wouldn’t be the worst news he received that year. During rehab for the knee, he was diagnosed with Hodgkin’s lymphoma. By May 2016, however, Conner announced he was cancer-free. On Sept. 10 of that year, he ran all over Penn State at Heinz Field, carrying for 117 yards and four touchdowns. James Conner was back in a big way. During that season, he rushed for more than 1,000 yards and scored 18 touchdowns. That led to a black-and-gold jersey and an extended relationship with Pittsburgh fans. During training camp this summer, fans incessantly called his name, trying to get an autograph or shake the hand of the NFL’s most popular back-up running back. Conner’s popularity isn’t just anecdotal, based on how many footballs he signs after practice. Earlier this summer, the NFL announced that Conner’s jersey was the best-selling jersey of any NFL player. 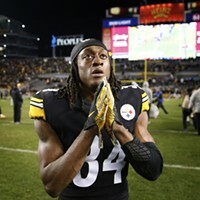 Better than Brady’s; better than Rodgers’; hell, even better than the jersey of the Steelers’ own Le’Veon Bell, the man whom Conner will back up this season. The gesture is not lost on Conner, but neither is the reality. How significant a role Conner plays in the Steelers offense this year depends a lot on how big a role Bell plays. Obviously, one would expect Bell to be the Steelers’ featured back given his immense success in the past. But there will likely be openings for Conner. With the 2017 season just a couple of weeks away, Bell didn’t even show up for camp, and that was after skipping the Steelers’ spring minicamps. He’s holding out for a better offer than the $12.2 million he’ll earn this year once he signs the tender mandated when the Steelers labeled him with their franchise tag in the offseason. He also turned down a deal the team agreed to with Bell’s agent that was worth north of $60 million, with half of that paid out in the first two years. It’s been reported that Bell wants $15 million a year. However, the Steelers have never been an organization to let players hold them hostage. 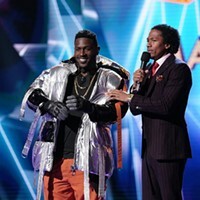 Bell — who has announced he’ll sign on Sept. 1 — is under organizational control until after the 2018 season, if the club gives him a second franchise tag. However, an emerging Conner would give the Steelers options if they decide to not give Bell every penny he wants, especially considering his injury history — he’s played all 16 games only once in his career — and some disciplinary issues, including an arrest for marijuana possession. Ordinarily, a team’s failure to re-sign a player of Bell’s caliber doesn’t play well with fans. But if that player is to be replaced by Conner, fans will likely respond positively. But all of that is in the future. Right now, as of this writing, Conner is a promising young pro with one preseason game under his belt. Fans have already elevated him to prime-time status. But he’s still a rookie who needs to pay his dues, including spending time, as most players have, on special teams —something that Tomlin recognizes and is not afraid to point out. Don’t worry. With all James Conner has accomplished and overcome thus far in his life, perfecting the art of kickoff coverage should be a snap.